Horizon Wind Energy has completed work on the 99 MW Blue Canyon V Wind Farm in Oklahoma-part of a multi-phase wind energy project-but the company has ambitious further plans in this Wind Belt State and is looking to add several thousand more megawatts of generation. Slick Hills-where the Blue Canyon V wind project is located-is a rock outcropping, so it was extremely rocky throughout the entire site. Specialized equipment was required to install the foundations and the collection system. Oklahoma, where the wind comes sweepin' down the plain, is the first line of the state song, so it's no surprise Horizon Wind Energy found Oklahoma to be an ideal location for three of its large wind farms. Horizon's Blue Canyon V Wind Farm is the third of a three-phase project. The 7,000-acre wind farm is located on the Slick Hills in Comanche County, and the 66-turbine project was completed in October 2009, on time and on budget. It has the capacity to produce 99 megawatts (MW)-enough energy to power approximately 30,000 homes. A combination of factors went into choosing the Slick Hills site, says Vanessa Kellogg, Horizon's director of development for the southwest region. "First, from a wind resource perspective, the topography is among the best in all of Oklahoma. There is also available transmission capacity, making it possible to get the energy produced by the wind to the load center, to customers. "We also had landowners excited about the prospect of developing wind power projects there," she added. "We developed two prior phases in the area starting in 2001, so we had a lot of momentum for this next phase." While some wind development companies' talk focuses on their team efforts with regional electrical companies, Horizon says that they are most proud of their relationships with landowners. "We work very closely with the landowners, and we do our best to put the landowners' concerns first," says John Stone, Director of Project Management. "We make changes in our wind farm layout as much as we can-from the way we construct some of the roads to where we put the electrical collection system-to ensure it works for the landowners. "We try to have a one-on-one relationship-certainly from the project management side," Stone added. "From the development side, however, we're involved for a much longer time. Our development folks try to really become part of the local community." Kellogg agrees wholeheartedly, and adds that it helps to build those bonds because wind power provides rural economic development and is highly compatible with existing land uses. "We're not supplanting the farming or ranching activities that are underway now, but rather supplementing the income and allowing folks to maintain their current land use operations," she says. "That means a lot of generational farms can remain in the family, even through tough economic times and low commodity prices." Ironically, the biggest obstacle in getting the Blue Canyon V wind farm up and running turned out to be...the wind. June and July turned out to be much windier than normal summers. "Consequently, we had to overcome many more wind delays during the construction process than normal, which required us to work 24 hours a day at times and 7 days a week for a series of months," says Stone. "There were also four towers that had to be unexpectedly relocated because of the FAA flight floor for the Fort Sill military base that's in the area." The other challenges were ones for which Horizon could prepare-like the rocky conditions. "We did have some soil on the site-a couple of cups full," says Stone with a smile. "Slick Hills is a rock outcropping, so it was extremely rocky throughout the entire project and required specialty equipment to install the foundations, the collection system, and the like." Due to the terrain, larger equipment and blasting were involved. And though it did add to the cost, Stone says it wasn't out of the ordinary and was considered up front. Stone was pleased, however, to find fewer snakes than anticipated. (Who wouldn't be?) "We had expected this to be a site that had a lot of snakes, but that wasn't the case," he says. "In general, the vibration makes them go down into the lower areas. And then once we stop, of course, they come back up and kind of reclaim where they were before." Although there were some challenges with the terrain, the landowners made up for it, by being easy-to-work-with partners. Despite a difficult economy, Horizon is still actively developing wind farms in 19 states and is on target to bring on 600 MW in 2010 as well as in 2011 and 2012. "They weren't necessarily familiar with the specific day-to-day impacts of construction, but they certainly could recognize the community benefits that immediately came to fruition just with the initial tax benefits and resources that went to the county and local establishments," says Kellogg. Job creation was another benefit. During the construction, Horizon brought 250 temporary construction jobs to the community, and at peak construction, there were over 300 construction workers on the site. "In this particular case, we didn't have to sell them on the idea of hosting a wind farm," says Kellogg. "It was just addressing their specific concerns, specific to their land." On the Blue Canyon I and II projects, Horizon had used Vestas turbines, but in the Blue Canyon V, they turned to General Electric turbines-66 GE 1.5 MW turbines to be exact-because they were well suited to the specific site conditions. "We typically procure an assortment of turbines for multiple years, well in advance," explains Kellogg. "Then we have our choice of what turbines will be allocated to which site. And these GE turbines were optimal turbines for the Blue Canyon V site." These particular GE turbines are nearly 265 feet high with a rotor approximately 254 feet in diameter. When turning, they prevent the annual emission of approximately 240,000 tons of carbon dioxide; more than 750,000 pounds of nitrogen oxide; and 950,000 tons of sulfur dioxide. In short, it's the equivalent of taking 30,000 cars off the road. With any wind farm there is a lot of time spent preparing and studying. Stone says Horizon will generally spend between six months to two years in development, depending on the number of landowners and the environmental conditions. In this case, because Horizon was working on phases I and II before developing this third phase, they used the full two years to measure the wind and conduct environmental and wildlife studies to ensure there were no adverse impacts-particularly avian impacts. 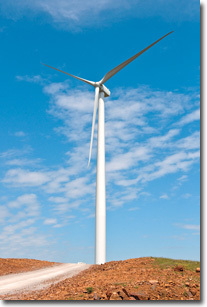 "We also did the standard geotechnical studies to determine where the turbines should be placed. And that usually takes a couple of months, in advance of construction," says Kellogg. A 20-year Power Purchase Agreement was entered into between Horizon and the Public Service Company of Oklahoma. Kellogg says anything from five to 20 years is common. "One of the benefits of a 20-year agreement is the certainty of having an offtaker for our power over the long term," says Kellogg. "It helps enable us to model our project economics well in advance for the lifetime of the project." "I think that cuts both ways," adds Stone. "The offtaker also knows they have a firm price-from day to day, from year to year." Blue Canyon V is the most recent Horizon wind farm to go into production, but that will hardly be the case for long. In Oklahoma alone, Horizon has plans to add a couple thousand more megawatts. "They are in various stages of development-from fairly mature projects to early stage prospects," says Kellogg. In addition, and despite a rocky economy, Horizon is still actively developing in 19 states and on target to bring on 600 MW in 2010 as well as in 2011 and 2012. A big benefit, of course, is the new jobs that renewable energy creates, says Kellogg. "With a wind farm, you're using a domestic resource, and you're using a domestic labor source. And it's something that remains part of the community and provides rural economic development for the life the project." She adds that the Obama Administration's Recovery and Reinvestment Act has also been very valuable in allowing Horizon to continue with its development plans. "I think some of the other projects and priorities that have been put in place by this administration-in particular transmission, long term strategic transmission planning-will help us. The best wind resources tend to be fairly remote from the load centers, and there's a lot of government support from the highest levels to get the transmission infrastructure in place so that we can take advantage of the domestic resources that we have." The wind industry as a whole is shooting for producing 20 percent of America's electrical energy with wind power by 2020, or 2030 by the latest. "It's something both independent and private entities have studied," says Kellogg. "Given the viable wind penetration, current technology, and infrastructure, 20 percent seems like a reasonable number to reach. So as an industry, we're looking at trying to meet and even surpass that. "Wind is never going to comprise 100 percent of our energy mix in the country, but it can certainly comprise a significant chunk of it," she added. As long as the wind keeps sweepin' down the plain in Oklahoma, the state can expect to be a dynamic piece of the mix.